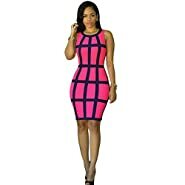 This dress is made of high quality stretchy fabric. Héloïse Fashion's priority is to make stylish, beautiful and durable dresses with absolutely no compromise on quality. - We recommend hand wash. No tumble dry, please! - The white model is slightly off-white. 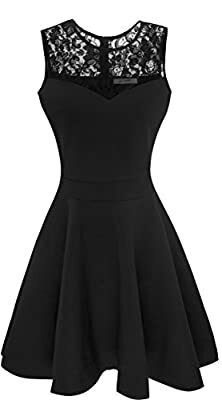 - You might have to steam or iron the bottom part of this dress at low temperature before wearing it. XS: Chest : 32"-33" WAIST : 24"-25" LENGTH : 34.5"
S: Chest : 33"-35" WAIST : 25"-27" LENGTH : 35"
M: Chest : 35"-37" WAIST : 27"-29" LENGTH : 36"
L: Chest : 37.5"-40" WAIST : 29"-32" LENGTH : 36"
XL: Chest : 40.5"-42.5" WAIST : 32.5"-34.5" LENGTH : 37"
XXL: Chest : 43"-46" WAIST : 34.5"-37" LENGTH : 37"
XXXL: Chest : 46"-48.5" WAIST : 39"-40" LENGTH : 39"
Our stylish short sleeveless A-line shaped evening dress with round neck is now available with both mesh or lace top. Some colors come in four variations: same color mesh, black mesh, black floral lace or same color floral lace. Casual yet suitable for any special occasion, from wedding ceremony to prom. Made with soft, high quality fabric that makes you look great! The stretchy fabric makes this dress close fitting, very comfortable to wear and super flattering. Hidden zipper at the back. Top back and front made with resistant nice see-through mesh or floral lace. This elegant dress hits just above the knee. Standard US sizes. For detailed information, please refer to image on the left or product description, not Amazon size guide. Original design and pattern since 2015, sold by Heloise Fashion under the trademark Sylvestidoso.